Knowing how to fix a couple of issues in your bathroom can give you peace of mind. After all, the last thing you want is your family complaining about how bad the shower is and how they can’t get a relaxing shower after a long way, or even worse when you get to pay a plumber to come to fix minor problems you could fix yourself. One of the most important skills you need to learn is how to remove flow restrictor from moen shower head. You might be taking a nice cold bath and you notice the flow of water from the moen shower head reducing or there is no pressure at all. There is a certain pressure that we like to see the water from the shower flowing; therefore, when you start noticing a slight change, the shower no longer feels enjoyable. When this happens, it could be an indication that the flow restrictor is clogged. A significant number of companies, including Moen fix a flow restrictor at the neck of the shower head to conserve water. Although the flow restrictor is handy, at times it can give you a headache, and one of the most common problems you are likely to experience is clogging. When this problem is not looked in to, you may have to buy a new shower head. When removing clogs in a Moen shower head, you need to be extremely careful because a wrong move could damage the threads in the shower head. Place a cloth on the shower head connection as you tighten the jaws with the adjustable wrench. Secure the shower pipe near the wall with one hand and turn the shower head connector in a counterclockwise direction using an adjustable wrench. 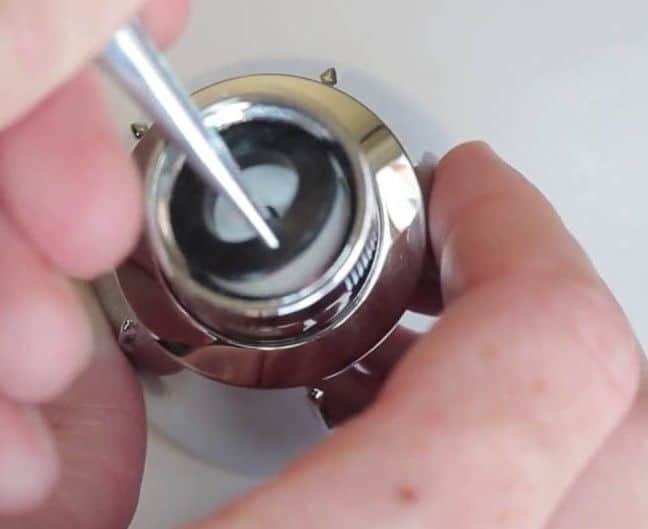 Use a screwdriver to insert into the corner tip of the shower head’s flow restrictor. Find the flow restrictor, which is a flat plastic piece in the neck of the shower head with small perforations. Use a screwdriver to slowly remove the flow restrictor out of the neck of the shower head. You need to be extremely careful when dealing with the inner threads of the shower head to avoid damage. Place the screen back into the shower head and put back the O ring against the screen, ensuring it is secured and tight. In order to ensure that it is tight and secure, use plumber tape to wrap around the shower arm threads. Thread back the Moen shower head to the shower arm in order to be able to turn it using your hand. Use a cloth (again laid on the connection) to hold the shower arm and turn the connections gently with the adjustable wrench. When completing this last step, you will be able to remove flow restriction for the Moen shower head successfully and put everything together. Before you perform the steps listed above on how to remove flow restrictor from shower head, make sure that you close all water faucets and the shower head must be completely drained off the water before you commence.